The weather has been extremely gloomy lately, which makes waking up for me such a pain the behind. Not only am I extremely cold because I can’t feel my bones due to the lack of sunshine, I am also extremely lazy because I don’t want to leave my cozy bed. The best thing to do for a smooth morning is to be prepared! If I know I’m going to have issues getting ready on a gloomy morning due to my grogginess, or if I want to sleep in an extra 30 minutes, I prep my outfits the night before to not wake up frantic. I’m lucky enough to work at an office that does not enforce a strict dress code, which makes it easy enough to be comfy and cute. Yoga leggings instead of pants? Yes, please! This is a more “dressed-up” comfy look. For some reason, a “sleek” ponytail makes me feel dressed up, and it only takes 2 minutes to style (win)! I paired this H&M sweater-shirt with my favorite Zara “distressed” jeans (similar pair here) and Peach Blush-toned Vans sneakers. I received compliments all day, even from my mom, whom never approves of my laziness. As a proud “Torita”, I love repping my school, CSU Dominguez Hills any time I can. I have a ton of CSUDH hoodies and t-shirts in my closet which I love to wear on casual days. I find that pairing hoodies with sneakers is my go to on cozy days. I gave up on super tight jeans long ago, so these high-waisted pair from Zara (similar pair linked above) are my go-to for a comfy look. Whenever I dress down my outfit, I dress up my face! I wore a bright pink lipstick for this outfit to look bright-eyed and bushy tailed! 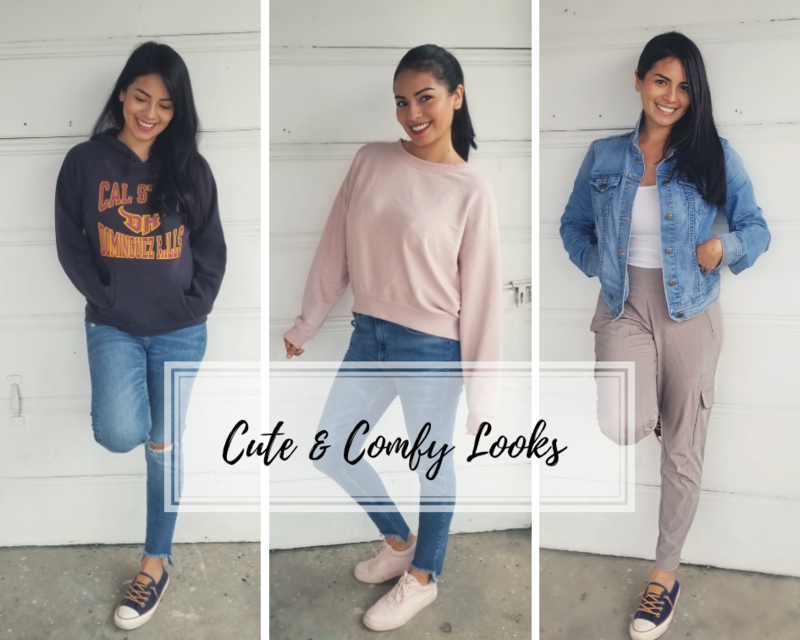 Super cute looks! Thankfully my job has a pretty lax dress code as well; lots of harem pants and cardigan maxis in my wardrobe as a result. Great post!